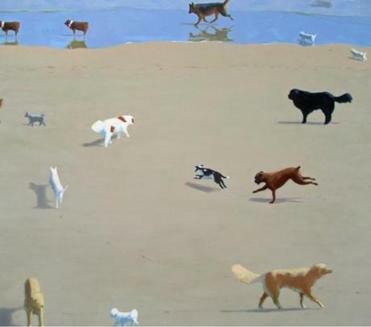 Rob Dieboll populates his beaches with dogs and their human companions. GLOUCESTER — Whale watching tours, fresh seafood, sandy beaches, and guys fishing for “Wicked Tuna” on a Nat Geo reality show — Gloucester is justifiably famous for all of these. Meanwhile, tucked away in sunlit studios around this seaport city (and in neighboring Rockport), artists create stunning works that are inspired by this rugged landscape of sea and sky. Lauded as one of the top 10 small cities for art by American Style magazine, Gloucester’s unique luminescence and dramatic geography have long attracted creative types. 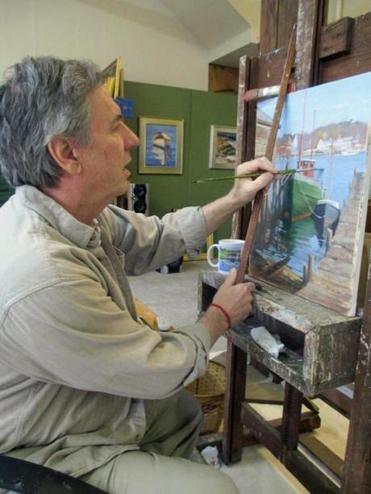 The city is home to Rocky Neck, one of oldest art colonies in the United States, and has hatched celebrities such as marine artist Fitz Henry Lane (1804-65), a Gloucester native. (The Cape Ann Museum, re-opening in mid-August, holds the world’s largest collection of Lane’s work.) Artists who have lived and worked here include Winslow Homer, Milton Avery, Edward Hopper, and Cecilia Beaux. And we’ve all admired “The Man at the Wheel,” the iconic piece created by sculptor Leonard Craske in the 1920s. “Art is really part of the DNA of this place,” says sea glass artist Jacqueline Ganim-DeFalco, who relocated to Gloucester from Manhattan and unleashed her creative side. Painter Rob Diebboll describes crossing the bridge into Cape Ann as “entering a remote world, far from the mania” of Boston. “It’s an incredibly rich island for making art, which explains the diverse group of artists here,” he says. 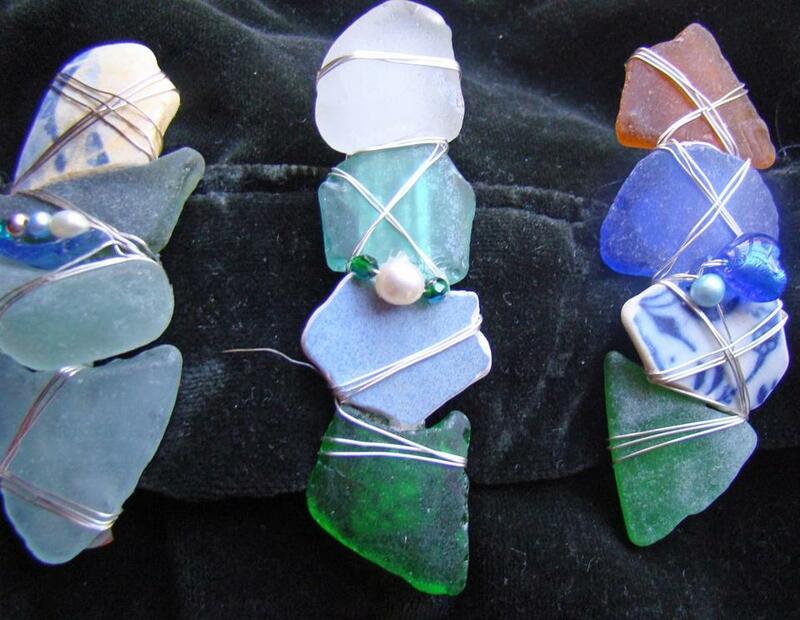 From seaweed to sea glass, granite to garbage, anything goes in the Cape Ann arts scene. 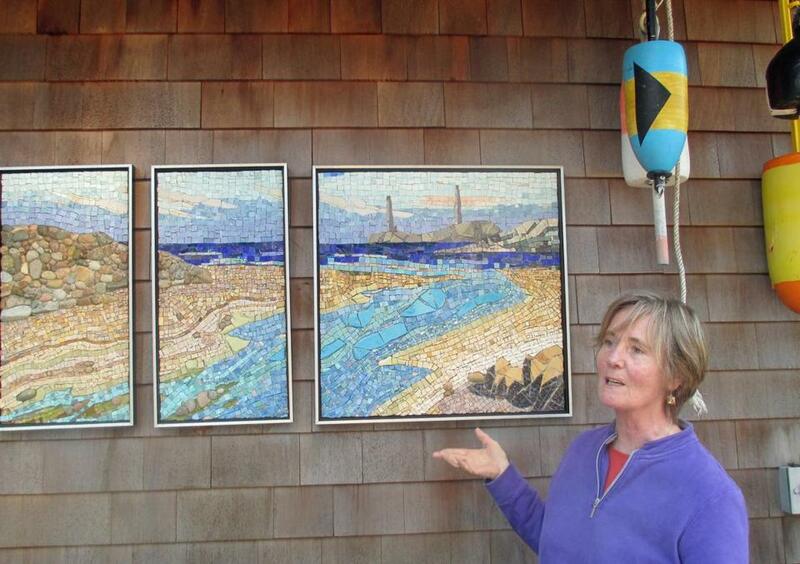 The best portal to this lively, color-splashed world: the 31st annual Cape Ann Artisans Open Studio Tour, on June 21-22 (and again on Oct. 11-13) from 10 a.m. to 5 p.m. Most are also open by appointment. Twenty-six artists at 23 studios are participating. You’ll see art being made, and discover local neighborhoods that most visitors miss as you follow this Tour de Art to pocket gardens, tiny courtyards, a hand-built barn, and a boat builder’s shed. Download a map at www.capeannartisans.com, and look for magenta banners that mark the studios. In the meantime, here’s a sneak peek behind the scenes. Jacqueline Ganim-DeFalco makes these hair accessories with local sea glass. 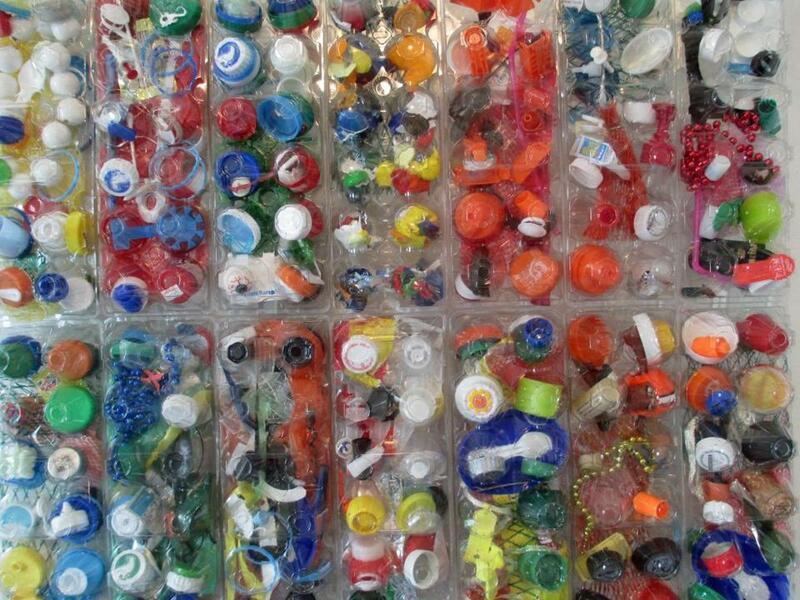 Sinikka Nogelo fills plastic egg containers with trash for his “Kitchen Egg” wall.